There is paid parking (as everywhere in Amsterdam) in front of the boat. Rates are steep; 5 Euro for an hour and plans to even raise the rate. A better option might be the Park and Ride facilities. 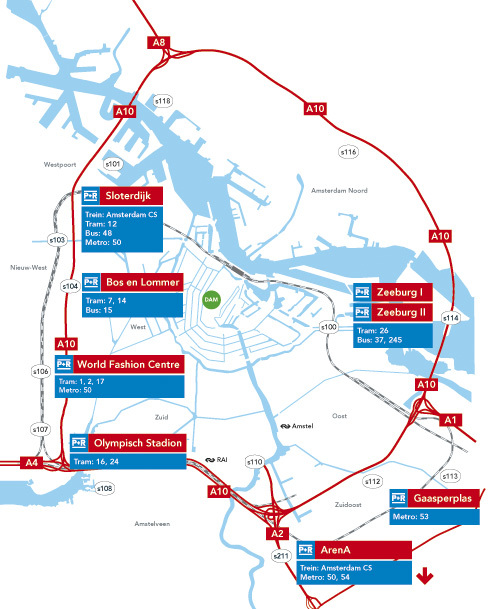 P+R (Park & Ride) is the smartest way for visitors to Amsterdam to park. These car parks are located on the outskirts of the city and have an excellent public transport connection. Public transport brings you right into the centre of Amsterdam in no time. Parking in a P+R car park costs only € 8.00 per 24 hours – with a maximum parking time of 96 hours. This fee includes FREE public transport to the centre of Amsterdam for a maximum of five people. Be sure to read all the instructions below before parking at a P+R location. In addition, we strongly advise you enter and exit the P+R locations during regular opening hours to ensure that you get the P+R discount rate. Collect a car park ticket as you go in. Please don’t use your credit card at the entrance, it does not provide the P+R discount. Hand over your parking ticket to the P+R car park attendant and ask for a P+R chip card(s). The car park attendant will code your parking ticket and give you a free P+R chip card to use on public transport. Proceed to the public transport hall and check in with your card by holding next to the electronic card reader. Don’t forget to check out when exiting the vehicle. When visiting the city, be sure not to lose your P+R chip card. If you do not use your chip card, or use it incorrectly, you will no longer be entitled to a discount and will have to pay the normal parking fee. Please note: The P+R chip card is only valid for travelling to and from the P+R location and not for general use in the city centre. In addition, P+R chip cards are not valid on special night busses. Use your P+R chip card for the return journey. Hold your P+R chip card in front of the card reader when entering and exiting the vehicle. Return your parking ticket and the used P+R chip cards to the P+R desk. The attendant will mark your car park ticket for the P+R rate. You can only pay the attendant with a pin or credit card. Cash payments can be made in a point-of-payment terminal. Use the car park ticket when you drive out. The special P+R rate is good for a maximum of four consecutive days (96 hours). After 96 hours you will have to pay the normal parking rate. This location is closed during major events at the ArenA. Check a list of event days on the ArenA website. Please note: there is no customer service desk at Zeeburg II. This locations is closed during major events at the World Fashion Centre. Visit their website for a list of upcoming events.